Castle views, spa bathrooms and16th century four-poster beds add an ageless charm to this memorable 4-star hotel in Conwy. The granite and Ruabon brick façade is simply gorgeous. 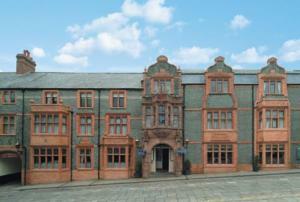 The Castle Hotel is one of Conwys more central hotels. Standing just five minutes walk from Conwy Railway Station on the A547, this handsome yet rather eccentric looking old Coaching Inn dates back to the 15th Century and sits on the site of an old Cistercian Abbey. Carved out the local Conwy granite and remodelled using the distinctive Ruabon brick you see today this wonderful and gently lavish hotel offers 28 bedrooms and suites, all decorated to a high-quality, 4-star standard. Contrary to expectations, the hotel boasts a contemporary and progressive boutique-style spirit and is supported by a solid range of modern amenities including wi-fi. The Club Rooms at the Castle Hotel are somewhat smaller, while the Premium Rooms have some tasty perks like Bose sound systems. The Deluxe Rooms boast impressive unique features, such as castle views, spa bathrooms or 16th century four-poster beds.